A pastoral lifestyle is that of shepherds herding livestock around open areas of land according to seasons and the changing availability of water and pasture. A pastoral is a work of this genre, also known as bucolic, from the Greek word meaning a cowherd. Grazing of cows finds recurring place in our literature. Down under, Shepherds were a critical component of the early wool industry in colonial Australia and persisted even after fencing was adopted and rapidly spread in the later 19thcentury. By some accounts, initially shepherds were convicts, but after transportation ceased in the late 1840s, emancipists and free men were employed. Their duty was the same as in England: look after the flock during the day, and pen them nightly in folds made of hurdles. Living conditions in huts were primitive, and the diet monotonous. Historically the sheep and goats were left to fend for themselves in the open paddocks, a system used to this day. They are shepherded by dogs as well. Livestock guardian dogs stay with the group of animals they protect as a full-time member of the flock or herd. Their ability to guard their herd is mainly instinctive, as the dog is bonded to the herd from an early age. The dog may attack or fight with a predator to protect the flock, if they are not able to drive predators off otherwise. There are animals which have become extinct over a period time, some due to specific activity of mankind. It is stated centuries ago, lynx roamed Britain, and now the Lynx UK Trust – a community interest company formed in 2014 by conservationists and scientists – wants to reintroduce them into Kielder Forest in Northumberland. There could be fresh trouble unthought of as well however, the trust feels that the cats will not threaten sheep: “It doesn’t matter that sheep are slower than a deer or an ‘easy meal’, in every real-world example, lynx show virtually no interest in killing sheep.” They claim that lynx have more of an appetite for foxes, which they claim will reduce fox-on-sheep predation. Here is something read in the Guardian of date ~ not so good as it is of hundreds of sheep plunging to death. Guardian reports that more than 200 sheep have plunged to their deaths in the Pyrenees while apparently trying to escape a brown bear. The bears have been reintroduced to the mountain region over the past three decades after being wiped out by hunters.The sheep, which belonged to a farmer in Couflens, south-west France, are thought to have taken fright when the bear appeared in the area last Sunday. After the predator (not the one pictured above - credit : the Guardian) attacked one of the sheep, 209 others in the flock panicked and hurled themselves off a 200 metre-high cliff on the border between France and Spain. The bodies of 169 sheep were found the next day at the foot of the cliff in the Spanish village of Lladorre. The other dead animals were found in France. The Spanish news agency Europa Press said bear fur had been found on one of the dead sheep and would be analysed to try to establish exactly what had happened.Although the French government will compensate the farmer for his loss, the incident has provoked an angry response from the local branch of the French farmers’ federation. 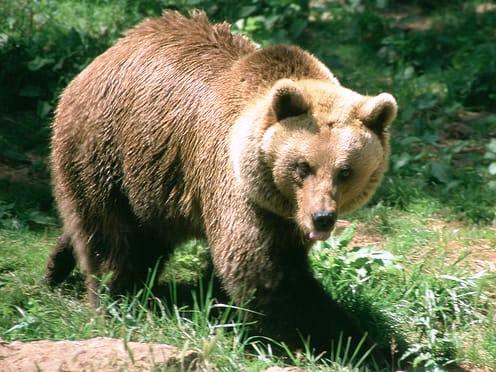 “Pastoralism – which protects biodiversity and keeps the mountains alive – is not compatible with the reintroduction of large predators,” said the ConfédérationPaysanne de l’Ariège.The last female brown bear native to the Pyrenees was shot dead by hunters in 2004. The French government has been engaged in a repopulation programme since the early 1990s, using bears from Slovenia. There are now thought to be about 30 brown bears in the region. Farmers on both sides of the border blame the bears for attacks on their livestock and the predators are sometimes killed. In September last year, the corpse of a brown bear – a protected species in Spain – was found with a gunshot wound to the chest in the northern regions of Asturias. Do you use DigiLocker ! ~ how facile ..